I have been coursed by Camille, Carrie and Brenda to post about my first quilt and my latest quilt. 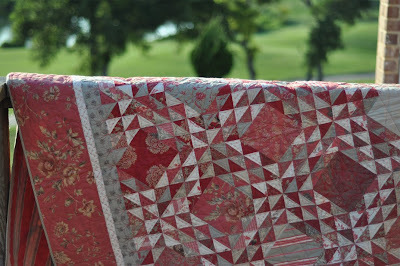 (read about it more on Camille’s blog) I am so super bummed that I threw away my first quilt. Yes, Yikes, Gads, I did. I have been made about it ever since. My first quilt was made using a sampler pack from Keepsake Quilting in Centre Harbour, ME. I ordered through a catalog and mailed them a check for a pack of 1000-1″ squares. Of course this was in 1980 and 1000 seemed like a really big number back then. I knew nothing about quilting much less sewing but that didn’t matter. My sister sewed her entire wardrobe all thorough high school and went to college to be a Home Ec teacher. If she could sew then certainly I could quilt. Can you spell COMPETITION? I began sewing these squares together and I am sure I thought that I was going to be able to make a full size quilt. I sewed and sewed and sewed 29 rows x 34 rows using 986 of the 1000 squares. Whew! My first quilt was a whopping 15″ x 17″ before I put a 3″ binding on it. Camille thanks for the encouragement because I thought this quilt was just a memory but I did come across a picture of my “pride and joy”. 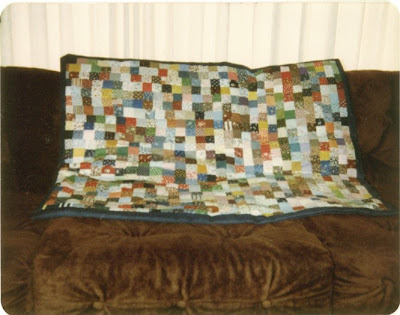 Yes the rust velvet couch the quilt is laying on proves that the pictures is from the 1980’s (inherited the couch with the husband) Okay I guess I would say that the quilting bug did bite and many, many quilts later I am proud to show my latest finished quilt. It is an oceans waves variation made using Rounneries by French General. I love how it turned out and I am thrilled that McCalls has picked it to be in one of their future magazine issues. Looking through these OLD pictures I did find a few more of my treasured old quilts that may have to turn into some future blogs!Tag you’re it. Show us your first quilt and your current quilt. uh yeah i would say there's a little bit of progress in talent there! wow. Your work is so amazing. You can tell your life story through your quilts, which is neat. I started much later, and may even have thrown it away, but will post my current as soon as I put the binding on it. Yesterday I picked it up from the machine quilter and I've already found about five "boo-boos". Learning all the time! What is it about men and ugly couches? I inherited one of those through marriage too. It didn't last long once I arrived 😉 That Ocean Waves quilt is gorgeous. Now I know what to do with my Rounneries FQ bundle. Wow! Wow…your French General quilt is simply stunning! I've been so interested to see what different quilters are going to do with the French General fabrics. Love the first quilt too…I admire anyone who started with such small pieces! That French General fabric makes me drool on myself a little. That quilt makes me quiver just thinking about making it! i think we call all say that we've come a long way from the very beginning. Just when I think you can't be any cooler… oh my word I love that quilt. Love, love, love. Not that the first isn't great, (1000 pieces is still a lot to me) but that is just gorgeous. Thanks for playing along, and THANKS for the goodies I got yesterday! You are so good to me! I have been loving seeing everyone's first and lastest quilts – it has given me hope to keep going. I adore your latest one – it is truly beautiful!!! I absolutely love your latest quilt. Can't wait til that fabric hits the stores! You should be very proud of your first quilt too. It is warm and beautiful. I'd say your first quilt was a little ambitious! One-inch squares? The ocean waves quilt is stunning, and very elegant. Can't wait to see it in McCall's! 1000 does seem like a big number… until you realize that with a one ince square that half is going away in the seam allowance! put props for making it and finishing… i think i would have given up! and i love the french general quilt.. i can't wait to see the fabric in person! I had a bunch of those 1 inch squares. I never did anything with them though. I hope you threw out the couch and kept the husband. The French General quilt is fabulous. That's a lot of half square triangles!!! I love Ocean Waves quilts. And yours is FAB-U-LOUS! Wow – you were certainly ambitious with your first quilt. And SUPER WOW – your French General quilt is scrumptious!!! Now . . . I can see that you were a dedicated quilter from the start! To order 1000 1" pieces! – wow! (& I agree. . . with 1000 pieces I would have also thought it would be at least lap size!) I still think it's a keeper! Your Ocean Waves quilt is. . . stunning. Wow. Love. It. I've come back to your blog to look at that quilt about 9 times now. *sigh* I think that just might be my favorite of yours so far! When does that issue come out? The French General quilt is delicious. I need to make one just like it, those fabrics will look fab in our master bedroom. That is good that you at least have a picture of your first quilt. I think it looked really cute. Can't believe you threw it away! Anyways, your latest is beautiful too! Love it! wowzers that quilt is beautiful! No wonder someone chose to feature your most recent quilt – it's amazing. I love your tiny squares quilt! So ambitious. Nothing like a little sisterly competition to motivate you! I love the beautiful Ocean Waves quilt and your first quilt is amazing, 1 inch squares would have been the death of quilting for me! Love, love, love that new quilt of yours! Also love the picture of Jarrod's 25th birthday. Are those all your guys? They really look like a fun bunch! Now I know why you couldn't come to France – you had to finish this amazing quilt!! Thanks so much Lissa for designing and quilting such a beautiful quilt – I love it!! Hi Lissa- Just came over from the MBS blog. Your first quilt kinda reminds me of mine. A bunch o' one inch squares (cut by hand, of course)bordered by yellow gingham. 1976. I was 18 and waiting for my first child to to born. You saw a lot more yellow back then because we didn't know what we were having! 🙂 Your newest quilt is certainly a sight to behold. McCalls will be lucky to publish it. Your new quilt is gorgeous…You just can't keep an old pattern down…the fabric you chose is just beautiful. And…not to be picky, but Keepsake Quilting is in New Hampshire, Not Maine.